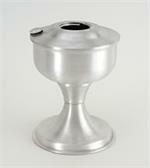 The Aladdin aluminum kerosene mantle lamps are designed with rugged economy in mind. Practical, without sacrificing function or quality. Our Aluminum Series is perfect for camp sites, cabins, and rustic homes. In these settings, the Aladdin aluminum lamps shine, displaying their heritage of providing clean, quiet, dependable light without electicity. This Aluminum Table Lamp Font (base) comes with nickel plated brass hardware with a durable laquered finish. Includes a fill cap for easy refilling. Holds 1 quart of kerosene. This item is just the Aluminum Table lamp font (base), you will need to provide or purchase a burner for this font. The collar (threads) on this lamp font are compatible with Aladdin Lamp burners Models B, C, 21, 21C, 23, 23A, and Maxbrite 500. The Aluminum Table lamp font is a good choice if you already have an Aladdin burner and just need to replace the font (base). 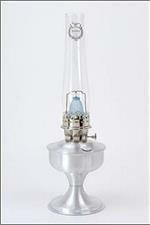 If you are looking for this base but as a complete lamp, the item number is A2310. Our Aluminum Series is perfect for camp sites, cabins, and rustic homes. Comes with MAXBRITE 500 Burner.